TimeTrak is a web-based application that allows your team to manage their time no matter where they are. With award interpretation enabled TimeTrak can automatically calcultate when overtime rates are applicable, which allows you to dramatically reduce time spent on payroll tasks. Using award interpretation your team can enter a single time entry for their entire day and TimeTrak will automatically take into account any overtime owed. This dramatically reduces manual entry of data and time spent on administrative tasks - leading to increased billable hours and profitability. With payroll integrated timesheets, TimeTrak reduces time spent on completing wages, allowing your payroll officers to complete wages in a timely manner, using real-time information. TimeTrak removes frustrations, paperwork and the huge amount of time it can take to complete this process. 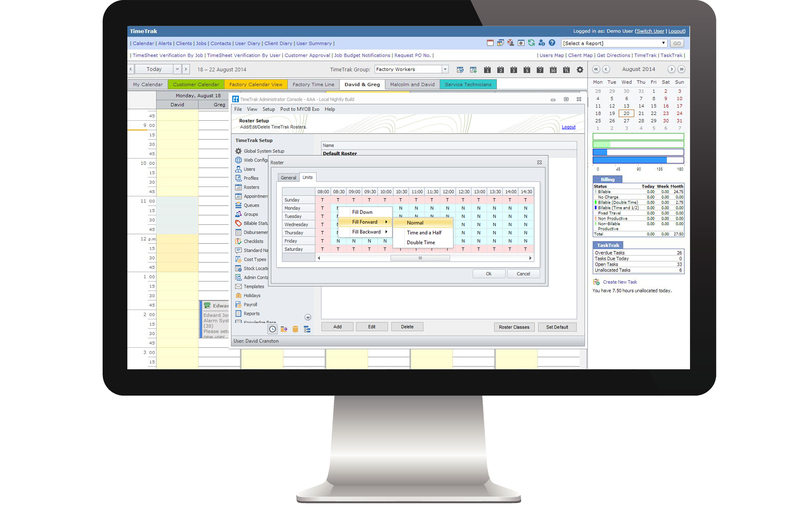 TimeTrak can help to streamline how your team works both in the office and in the field. Simple math - less time spent on data entry, means more time spent in the field completing billable work. Leave TimeTrak to manage award interpretation of your team - this a great feature for businesses with Payroll integration. Solutions for your healthcare business, from the office to your medical practitioners out and about.